Harmeet Desai is an Indian Table Tennis player who was part of the Indian Men's Team who won the Gold Medal in 2018 Commonwealth Games. He also won a bronze medal along with Sanil Shetty in the Men's Doubles category. In an exclusive interview with Sportskeeda, Desai talks about his triumph in Commonwealth Games and his experience in Ultimate Table Tennis. Q. You were the one of the members of the Men's Team who won the Gold Medal in CWG 2018. What does this accomplishment means to you? Desai: It means a lot to win a gold medal for India. It was my dream to win a medal for my country in the CWG and hear the national anthem in the foreign land. Q. 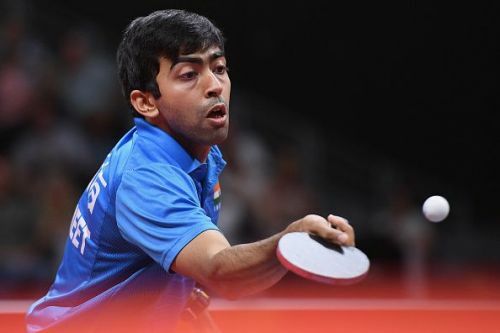 What changes have you observed in the TT Camp which has boosted the level of Table Tennis in India? Desai: I think there are many positive changes that has helped Indian Table Tennis to reach at this height. The federation has a more professional approach, giving more exposure to the players. Also the Government has played a very big role by uplifting the sport. The players are training abroad, playing leagues abroad and getting more and more experience. Moreover, the leagues like UTT in India has helped our Indian players to believe that we can also compete with the top in the business. Q. What prompted you to choose Table Tennis as your career? Desai: It was my father, who used to play table tennis with his friends. So, he bought a table home. Then I started playing with my father, and got attracted towards the game and it soon became my passion. Q. You were associated with RP-SG Mavericks in Ultimate Table Tennis. How was your experience with the team? Desai: It was an amazing experience to be a part of the team. We just became like a family. We started off pretty well by winning 4 out of 4 matches. It was a pity that we couldn't go all the way, but I am really happy that all the players of my team gave their best. Q. Which particular match/tournament would you like to call as the turning point of your career? Desai: It was when I won the Austrian Junior open title in 2011. Q. There are various youngsters who wish to opt table tennis as their career. What piece of advice would like to give to them? Desai: I would just like to tell them to work hard with a lot of dedication and patience in order to reach their goals.